If there is one thing I've learned during the past year at Google, it's that the mantra "launch and iterate" is exemplified in everything the company does. A perfect example of this is one of Google's lesser known social services, Schemer. Schemer started out several months back as an invite-only service but has since opened up registration to the public at large. The service is unique in that a pre-requisite for registration is having an existing Google+ account. While a variety of web services now offer new users the chance to expedite signing-up by piggybacking on Facebook's OAuth client, Schemer is the only website to my knowledge that does the same except with Google+. The Schemer team, and Google itself for that matter have been notoriously vague as to their plans going forward. A youtube video posted by Google in November of last year sort of explains what the service does, but if I didn't know better I might just think Schemer was targeted at hipsters living in urban environments (the inclusion of a mustache as their logo doesn't help the cause much). I also found it interesting that while all of Google is unifying under a common visual framework, Schemer seems to be blazing its own path with regard to design and overall user experience. The actual service itself is pretty straightforward. Upon signing up Schemer prompts you to enter in several addresses (Home, Work, Parents House, etc). You are then able to add general high-level interests (Running, Hiking, Italian Food). Anyone in your Google+ circles is then used in conjunction with your interest, location, and time of day to suggest "Schemes" you might be interested in completing. A scheme might be something as simply as eating a certain dish at a local restaurant or as complex as running a marathon. Users interested in completing Schemes can mark them as "I want to do", whereas schemes you have already completed can be marked "Done". Marking a scheme complete prompts you to add a brief not about your experience which is then viewable by others interested in that same scheme. If something your interested in doing hasn't already been added as a scheme, creating a new entry is as simple as adding a brief description, location, relevant category tags, and a image of the completed or intended activity. On your profile page, Schemer also keeps track of what users you are inspiring (users who want to complete schemes you have completed/created) and who inspires you. More than anything, Schemer can be thought of as a localized social service which piggy-backs on Google+. While there are currently an abundance of Schemes to choose from, in my experience Scheme's outside of major urban areas have been few and far between. The large majority of schemes also seem to be oriented around food. While this is not a bad thing, it would be nicer to see a larger variety of activities to choose from. 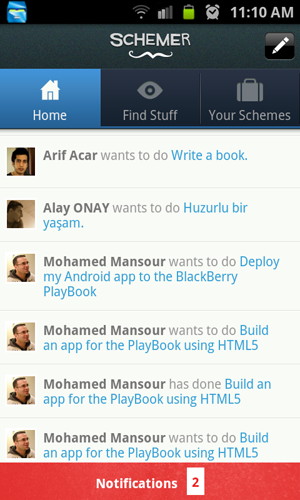 Even if you don't have a lot of friends in your Google+ services, Schemer is worth checking out. The community and the service still have a long way to go but at this stage it appears well on its way. I'm also concerned as to whether the service will actually survive in the long term. Google has been known to nix services that don't gain widespread adoption and the inclusion of a first-party local layer into Google+ itself would negate a lot of what Schemer currently offers its user-base. 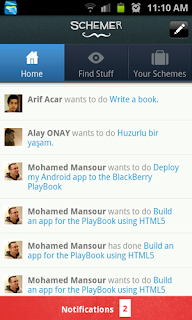 Schemer also has a pair of well-designed mobile applications available on both iPhone and Android. I would encourage you to at the very least browse Schemer's offerings and feel free to check out my Schemer page if you are looking for some bay-area schemes to complete! Posted by Patrick Dugan on May 26, 2012 .